L'Oceano d'Or is luxury camping gold. Situated just outside the charming coastal town of Jard-sur-Mer, and surrounded by magnificent countryside, come and unwind on a holiday brimming with laughter and adventure under glorious sunshine at L'Oceano d'Or luxury camping site. Why choose L'Oceano d'Or? Live entertainment over the summer in the campsite’s amphitheatre, plus loads of opportunities for off-site fun, either at the beach or in the unspoilt greenery of the Vendée, make this the perfect choice for children, teenagers and adults alike. Staying in a comfy LUX-camp mobile home for your family camping. Youngsters of all ages will head immediately to the pool complex. Toddlers will no longer have to look on with envy as their older siblings ride the water slides and chute. The shallow splash pool is conveniently situated beside the indoor lagoon pool and is equipped with its own colourful mini-slides for them to safely play on. The outdoor family pool also has an area for small children. Relax in the sun or under a palm tree on the terrace and listen to the soothing sounds of the waterfall. 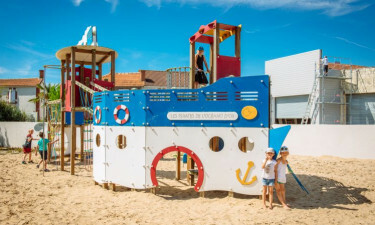 The children’s sandy playground has swings, slides, climbing frame and a roundabout. It’s a lively area for play and also a place where new friendships are made. Adults who are able to tear themselves away from the pool can test themselves at tennis, basketball, volleyball, boules or table tennis. The nearest beach at Jard-sur-Mer is just 1.2km from the campsite. There are a number of beaches along this coastline worth exploring. The wonderful La Plage du Pe du Canon to the north of the harbour is a beautiful spot. The rock pools of La Plage de Morpoigne next to the harbour will fascinate children. La Plage du Grand Boisvinet, to the south, is the place for windsurfing and diving. 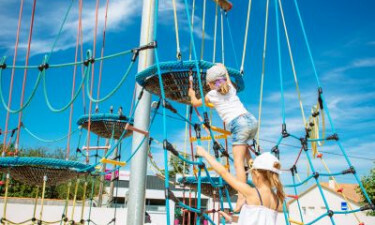 For thrills on land, take the family to the brilliant adventure park at the Mervent-Vouvant Forest or to the huge adventure playground, Indian Forest, near Moutiers-les Mauxfaits. The Vendée is rich in historical sites and architectural beauty. The Château de la Guignardière and Château Tiffaugues make excellent destinations for a day out and the abbeys of Maillezais and Nieul-sur-l’Autize are not to be missed. The Notre Dame de Bon Port church is just one of many attractions in Les Sables d’Olonne. For jousting knights on horseback and other displays of medieval combat, visit Le Château de Talmont, the fortress of Richard the Lion Heart. 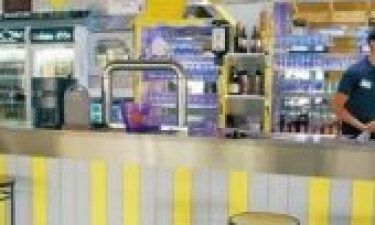 There is an on-site takeaway and bar open during the summer season. In Jard-sur-Mer you will find a choice of fine restaurants, as well as bars and cafés. The small grocery is also open during the summer and caters to all your immediate luxury camping needs. For all other shopping, Jard-sur-Mer is close by.